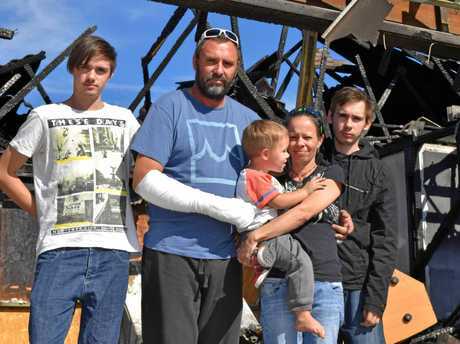 WITHIN minutes of a smoke alarm ringing through their house on Saturday night a family of seven found themselves standing on the street, watching their Deebing Heights home burn. Christian Russell, his wife Nicole Wright and their five children were at home just after 8pm when the smoke alarm started to sound. 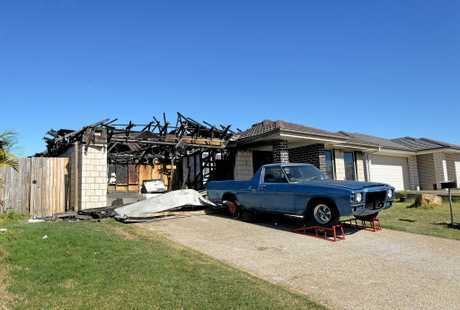 The flames were coming from the garage, metres from children in the living room, when Mr Russell kicked in the door in an attempt to save the house and their possessions. He fell over into the flames, burning his arm, hand and fingers. "I thought when I ran down it would be only little, we might be able to throw a pot of water on it, but it was raging. The heat was intense, it was big orange and black flames," Mr Russell said. "I kicked the door in, it slammed shut so I kicked it three more times and it was like somebody just put a flame thrower on. I was trying to see what I could do. By the time we got down here it was already raging." The family sprinted to out the back door and onto the street where they could do nothing but watch the flames destroy the house. "I was running up and down the street screaming help. I was hysterical screaming and yelling. You can't tell your brain what's normal and what's not at that time. I was screaming where are we going to live, that's our home," Mr Russell said. Ms Wright said it was the family's dream home that the couple designed and built for their family three years ago. "Christian went running out and Steven was yelling fire Dad, fire. By the time Christen got in, it was on fire," she said. "He was saying get some water and I said babe water isn't going to do anything, we need to get out. 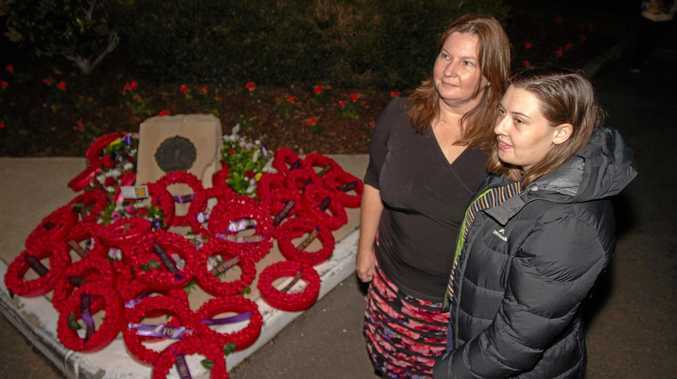 We couldn't believe our house was on fire, what happened, it was a normal Saturday night." The family is in need of accommodation, clothing, furniture, school and baby supplies but say the community generosity has already been overwhelming. "I want to say thank you to the community for what they've done," Ms Wright said. Polly's Delightful Pastrys owner and manager Lisa Warburton has offered her business, on Warwick Rd at Yamanto, as a collection point for donations. "I don't know the family but my business is in the area so I thought it would be nice and close," she said. "I am open from 5.30am-3pm so people can drop clothes in here, toys, tinned food and manchester. We just don't have room for big furniture." To make a contribution to the Gofundme account visit https://www.gofundme.com/3vr2kug. Police and Queensland Fire and Emergency Service investigations into the cause of the fire are continuing but it is not being treated as suspicious.